Our intimate farm house and surrounding grounds combine to create a picturesque site to enjoy some of the best food around. Chef Tad makes use of the freshest local and seasonal ingredients available, much of which is sourced from our own gardens. 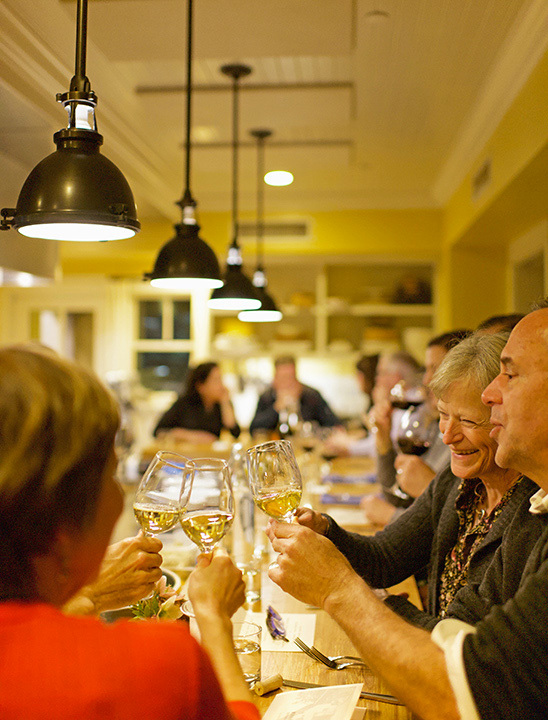 Gather around our community farm house or rustic barn tables, or sit at the Chef’s counter and watch the action. No matter where you sit, you will enjoy an unforgettable experience. This spring we are excited to have well-known winemaker Chateau Ste. Michelle join us on the farm for a wonderful evening of food and wine, celebrating “The Chateau You Don’t Know So Well”. Please join us as we welcome Craig Katz, Certified Sommelier from Chateau Ste. Michelle. Most people have heard of Chateau Ste. Michelle, and are familiar with their wine and wonderful concert venue in Woodinville, WA. This month we bring you a side of the popular winery that most folks have not experienced. What you might not know is that Chateau Ste. Michelle’s winemakers have teamed up with wine makers from Italy to create some tasty Washington Rhone style wines right here in Washington. We’ll be enjoying wines that are Limited Releases, not available to the general public. We invite you to this evening full of good wine, history and education. The evening will start out in our festive barn with Craig pouring a tasting of a selection of wines from Chateau Ste. Michelle. Guests will then be invited into the Farmhouse to enjoy a 4-course meal prepared by our Executive Chef, Tadao Mitsui. $85.00 per person. Ticket includes wine tasting upon arrival, 4-course meal, tax and gratuity. Additional wines will be available for purchase by the glass, bottle and case. If you would like to make a night of it, stay in one of our comfortable guest rooms at Heyday Farm! Spring Sunday Supper at Heyday Farm! May flowers are springing up all around us! The peonies are reaching for the sky! The farm has all the harbingers of spring, and a season filled with the promise of warmth and the sunny days ahead. Join us for a four-course Sunday dinner to be enjoyed at our community tables, served family-style. $65.00 includes dinner, tax & gratuity on meal. Beer & wine is available for purchase. Heyday Farm House is proud to present our upcoming wine dinner with Nate Ready of Hiyu Wine Farm on May 10th. Hiyu is a biodynamic 30-acre farm near the summit of Mt. Hood, Oregon where they raise animals, tend vines, garden, cook and produce wines that showcase the land in which they are grown. Smockshop Band Wines are also under the Hiyu label with vineyards in the Columbia Gorge. With such a variety of terroir in the Gorge they can offer up a different style of wines while still using their nature guided philosophy of farming and tending. The animals they raise also help with tending the vines. The pigs help dig up the ground as they root through the rows in search of food. They let the grapes grow as natural as possible, with the least amount of interference possible, which in turn has produced some amazing wines. The night will start out at 6:00pm on Heyday’s patio (weather dependent) with Nate Ready and a sampling of his wines from both Hiyu and the Smockshop Band label. You will get to hear more on his unique farming practices and commitment to sustainability. Guests will then be invited into the farmhouse for a 4-course wine inspired dinner created by Chef Tadao Mitsui. Wine will be available for purchase by the glass, bottle or case. $85.00 per person. Ticket includes wine tasting upon arrival, 4-course meal, tax and gratuity. Additional wines will be available for purchase by the glass, bottle & case. Year round, on Tuesday evenings, we open the Farm House to the community for an open-seating dinner. Seating begins at 5:00pm with the last seating at 8:30pm. Our ‘a la carte’ menu reflects the season and fresh local ingredients, and changes every week based on what is available. Come enjoy fabulous food with local folks to celebrate both the bounty of Bainbridge Island’s Heyday Farm as well as other wonderful regional producers. Heyday Farm House invites you to join us at our many public meals, from our weekly Tuesday community dinners, to Sunday Supper, to guest chef, winemaker’s and unique pop-up dinners. 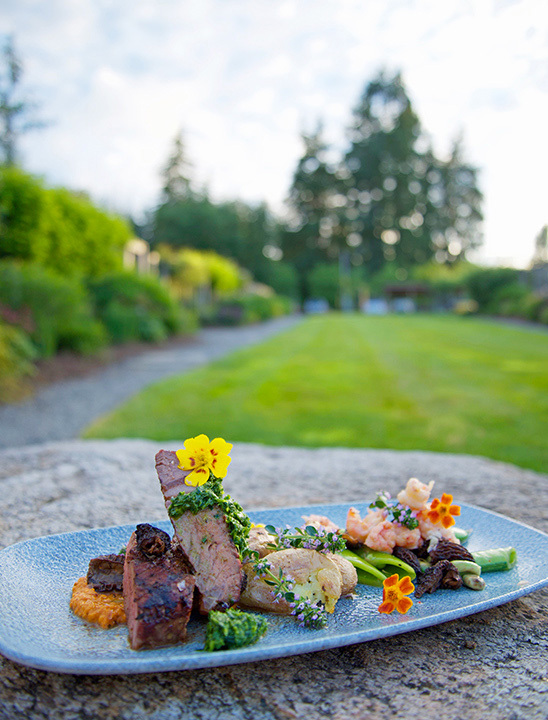 Enjoy our grounds, meet new friends, and dine on exquisite food. Year round, on Tuesday evenings, we open the Farm House to the community for an open-seating dinner between 5:00 – 8:30PM. This is first come, first served, we do not take reservations. 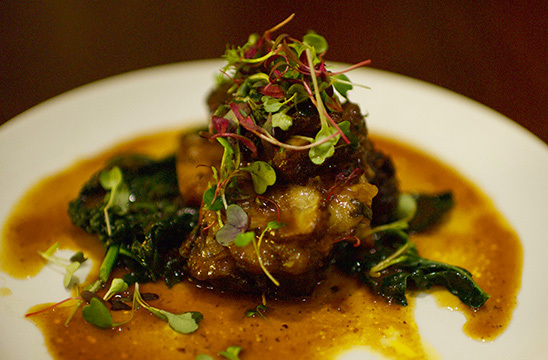 Our ‘a la carte’ menu changes every week and reflects the season and fresh local ingredients. Come enjoy Chef Tad’s fabulous food with other local folks to celebrate the bounty of Heyday Farm as well as other wonderful regional producers. One Sunday a month, join us for Sunday Supper. Just like you remember at grandma’s house, we’re serving up a comforting Sunday dinner to be enjoyed at our community tables. These four-course meals are served family-style, with the menu changing weekly and carefully designed to take advantage of the flavors of the fall season. The date and theme for each month’s supper is announced in advance with tickets available online. Stay informed of the schedule by subscribing to our newsletter and following us on Facebook. Throughout the year we also offer other exciting dining experiences. Join our mailing list to stay informed and be sure to check our Facebook page page for information on upcoming dinners. As always, e-mail info@heydayfarm.com or call us at 206-201-1770 if you have any questions about an upcoming event. Hosting a party or event at another location? The Heyday Farm House kitchen staff can bring our wonderful seasonal menus to you. We can prepare catered events with anything from passed appetizers, to buffets, to plated seated dinners, all within a variety of budgets. Chef Tad and team make use of the freshest local ingredients to create unique menus that will be sure to dazzle your guests.